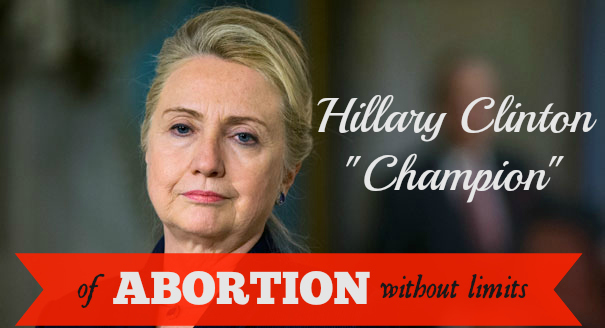 Under the guise of wishing to make abortion “safe, legal, and rare,” Clinton has done just the opposite, working with the abortion business like the International Planned Parenthood Federation to spread abortion all around the globe during her tenure as U.S. Secretary of State. As Secretary of State, Clinton also remained tragically silent on the human rights issue of forced abortion in China under its One Child Policy. And one doesn’t have to look hard to discover that Clinton promoted abortion-on-demand here in the United States as well. Her record going back to the 1990’s shows that at every turn, Clinton sought to reject every possible effort to save the lives of the unborn from abortion. Whether it was her disastrous abortion-expanding healthcare proposal, opposition to the Partial-Birth Abortion Ban Act, or cozying up to the extreme pro-abortion group EMILY’s List, Clinton has made it clear that her goal is to “champion” abortion and its industry, at the cost of the most vulnerable Americans, the unborn. Paid for by Wisconsin Right to Life PAC, Rick Fox, Treasurer. Not authorized by any candidate or candidate’s agent or committee. The committee is the sole source of this communication and the committee did not act in cooperation or consultation with, and in concert with, or at the request or suggestion of any candidate or any agent or authorized committee of a candidate who is supported or opposed by this communication.